A Facebook post by Chairman and CEO of Rafflesia Holdings Pte Ltd, Mano Sabnani, has mysteriously disappeared. The post, published on the 7th of March, was on the contrast between the behaviour of parliamentarians in the UK and Singapore. According to Sabnani, it received 350 reactions, 155 comments and was shared 650 times before it was mysteriously taken down two days later. It still remains unclear as to why or if Facebook took down the post. 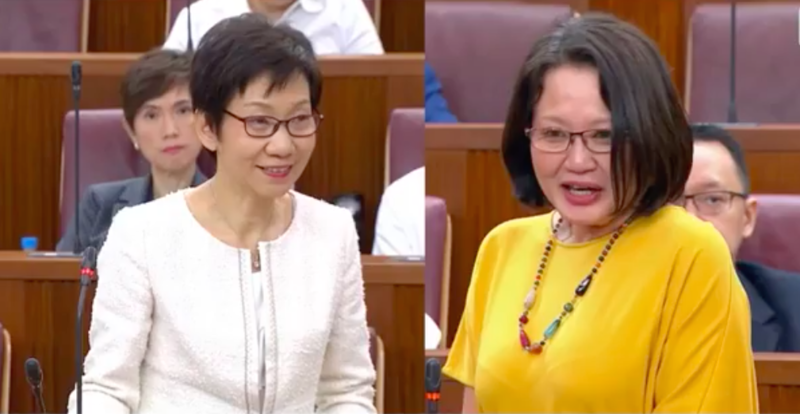 Sabnani’s post compared British Minister, Lord Michael Bates and Singapore’s Member of Parliament (MP), Sylvia Lim. Lord Michael Bates, Conservative Party politician in the United Kingdom offered his resignation for arriving late to a session of the House of Lords. He explained that as a result of his tardiness, he was not “in [his] place to answer [a] question on a very important matter at the beginning of questions”. He also added, “I’ve always believed that we should rise to the highest possible standards of courtesy and respect in responding on behalf of the government to the legitimate questions of the legislature”. 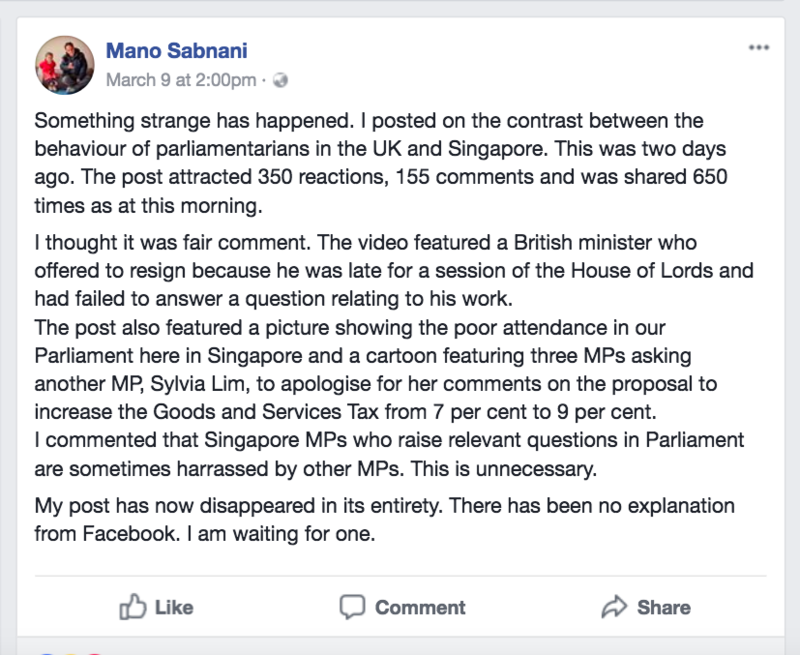 In his Facebook post, Mano Sabnani also brought up the conduct of MPs in Singapore, their attendance rates and the saga that occurred with Leader of the House Grace Fu demanding an apology from Sylvia Lim for a comment she made. Upon reaching out to Sabnani, he declined to comment. However, netizens had lots to say on the matter, alongside much speculation. Jason Kam commented, “1) Someone must be have reported your post and flagged the content as inappropriate. It probably isn’t just anyone that flagged either. This is why it is better to share certain subject matter and opinions in a closed group. 2) Could this be the effect of Facebook combatting ‘fake news’? That would be even more concerning. Looking forward to their reply”. Many also made references to George Orwell’s famous novel 1984, which features a totalitarian, bureaucratic state. 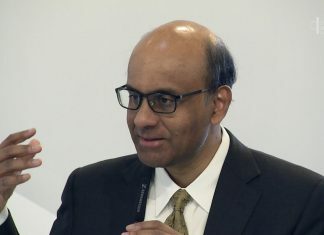 When asked by Lawrence Soh, “Mr. Mano, please repost. I missed that. Thank you”. Sabnani’s reply was curt, “Can’t get the comments back”, he said. Mano Sabnani’s original Facebook post still remains very much a mystery.